19th-century red velvet with gilt metal clasps and corners, two center pieces representing the Bearing of the Cross and the Child Jesus on clouds with cross and chalice. Purchased by Richard Bennett, Jan. 31, 1893; Catalogue of manuscripts and early printed books from the libraries of William Morris, Richard Bennett, Bertram, fourth Earl of Ashburnham, and other sources, no. 56; purchased by J. Pierpont Morgan (1837-1913) with the Bennett Collection in 1902; J.P. Morgan (1867-1943). 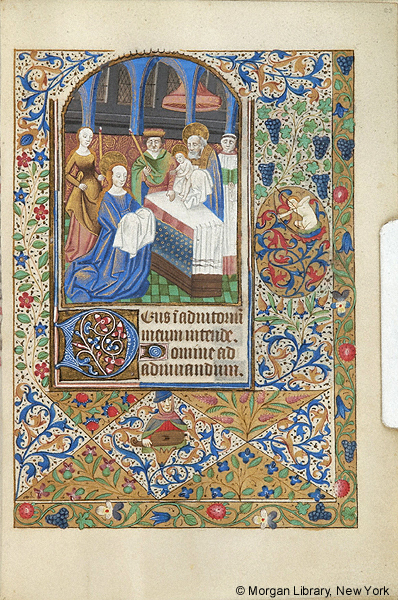 Ms. book of hours for the use of Lisieux (Hours of the Virgin) and Sarum/Rouen (Office of the Dead, calendar); written and illuminated in Rouen, France, ca. 1470-1480.